Excel NETWORKDAYS function can be used when you want to get the number of working days between two given dates. It does not count the weekends between the specified dates (by default the weekend is Saturday and Sunday). It can also exclude any specified holidays. A typical situation where you can use this function is to calculate the benefits accrued to employees overtime. It returns a positive integer that represents the total number of working days between two specified dates. [holidays] – (Optional) It is a range of dates that are excluded from the calculation. For example, these could be national/public holidays. This could be entered as a reference to a range of cells that contains the dates, or could be an array of serial numbers that represent the dates. Saturday and Sunday are considered as weekends by default and are not counted. In case you want the weekends to be days other than Saturday and Sunday, use the NETWORKDAYS.INTL function. NETWORKDAYS function returns the #VALUE! error if any of the arguments is not valid. This function is a part of the Analysis Tool Pack (ATP) and not Excel in-built functions. Hence, in case you get a #NAME! error, it could be due to not having the ATP or it not being loaded properly. Iu such case, try reloading the ATP. In the above example, the Excel NETWORKDAYS function calculates the number of days between 20th December and 10 January. It only excludes the weekends (Saturdays and Sundays) and returns 15 as the result. In this case, we have specified no holidays, so only weekends are excluded. In the above example, the Excel NETWORKDAYS function calculates the number of days between 20th December and 10 January. It excludes the weekends (Saturdays and Sundays) and the specified holidays. The result is 13 days. 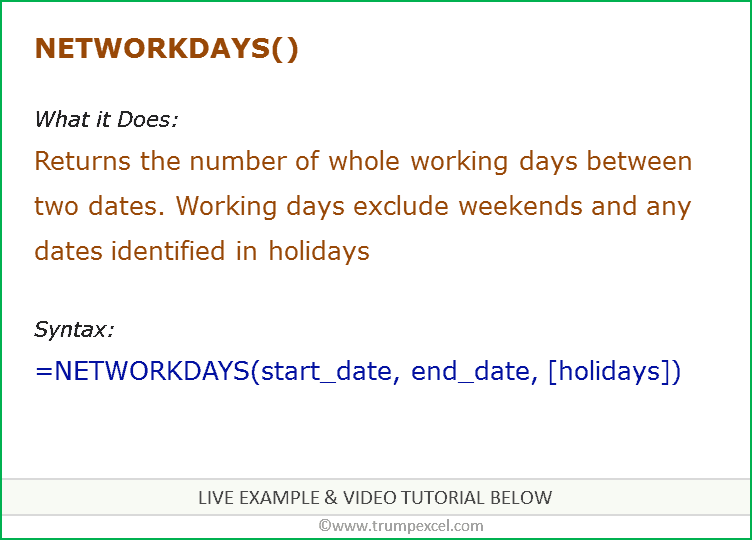 In this case, we have specified 2 days as holidays, and these are not counted while calculating the total number of working days. Note that these two holidays occur on a weekday (both 25th Dec 2015 and 01 Jan 2016 occur on a Friday). In case a holiday occurs on a weekend, it is not counted as an exclusion (as weekends are anyway not counted). In the above example, if you change 01 Jan 2016 (which is a Friday) to 02 Jan 2016 (which is a Saturday), the result would change to 14. Using DATE Function in Excel: Excel DATE function can be used when you want to get the date value using the year, month and, day values as the input arguments. It returns a serial number that represents a specific date in Excel. 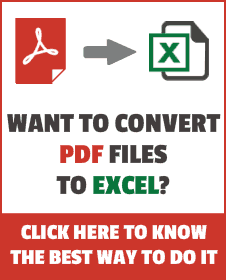 Using DATEVALUE Function in Excel: Excel DATEVALUE function is best suited for situations when a date is stored as text. This function converts the date from text format to a serial number that Excel recognizes as a date. Using NETWORKDAYS.INTL Function in Excel: Excel NETWORKDAYS.INTL function can be used when you want to get the number of working days between two given dates. It does not count the weekends and holidays, both of which can be specified by the user. It also enables you to specify the weekend (for example, you can specify Friday and Saturday as the weekend, or only Sunday as the weekend). Using TODAY Function in Excel: Excel TODAY function can be used to get the current date. It returns a serial number that represents the current date. Using WEEKDAY Function in Excel: Excel WEEKDAY function can be used to get the day of the week as a number for the specified date. It returns a number between 1 and 7 that represents the corresponding day of the week. Using WORKDAY.INTL Function in Excel: Excel WORKDAY.INTL function can be used when you want to get the date after a given number of working days. In this function, you can specify the weekend to be days other than Saturday and Sunday. Using DATEDIF Function in Excel: Excel DATEDIF function can be used when you want to calculate the number of years, months, or days between the two specified dates. A good example would be calculating the age.